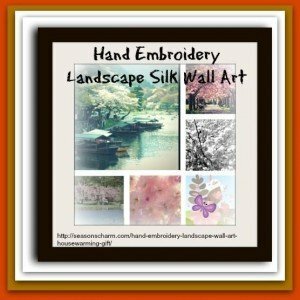 Skilled craftsmanship and vibrant colors make this hand embroidery landscape wall art housewarming gift truly unique and beautiful. An embroidered artwork of cherry blossoms with Mount Fuji in the background is a symbol of hope and strength. 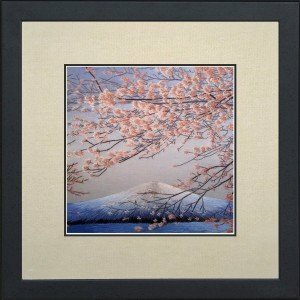 Measuring 13″x 13″x 0.6″ with black wood frame and glass, this cherry blossom Mount Fuji framed silk wall art is 100% hand-stitched by master artists in Suzhou, China using tiny needles and pure silk thread. Amazingly precise, intricate and detailed in the craftsmanship, the picture has depth and richness in its picture and colors. It looks so alive! Be awed by the shimmering silk threads when light falls on them and the soft glow when the environment is dim. Patience and time has certainly gone into the detailed embroidery of this artwork making it so perfect and beautiful. This is a stunning piece of hand embroidery silk art deserving a prominent place in your home. This simple yet elegant and exquisite hand embroidery landscape wall art housewarming gift makes an awesome wall decor artwork indeed.